Coffee Origin Road Trip to Nicaragua - "Had a good holiday?" I am frequently asked on returning from a coffee sourcing trip. To which I invariably reply: "Now look, it wasn't a holiday - It was much more than a holiday!" These trips are at the same time exhausting and invigorating and I fully appreciate the privileged position from which we observe our subject matter, usually high up in some 4X4 Toyota, be it a Landcruiser or the back of a pick-up truck! 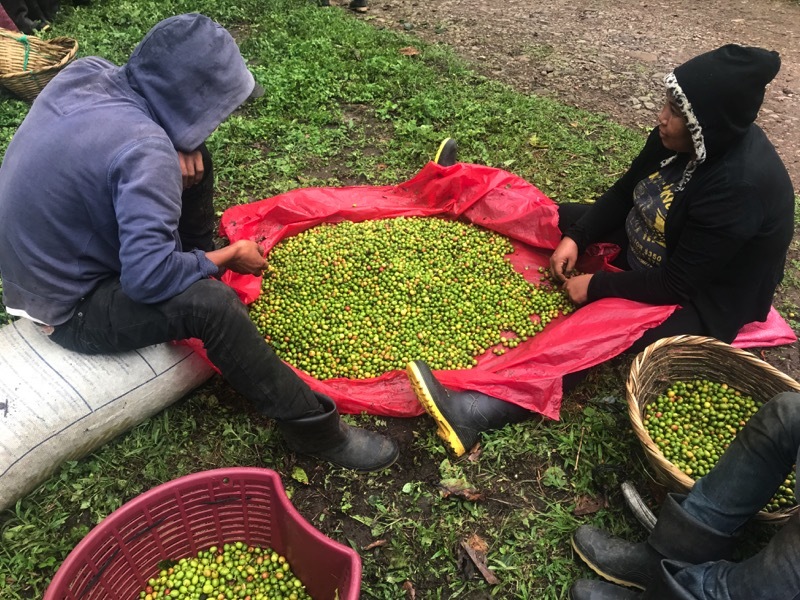 I know we are so lucky to see behind the scenes of the everyday lives of coffee folk at origin and to be shown around by the people who actually live there. We are all gathered together by the same thread, the golden thread of coffee. 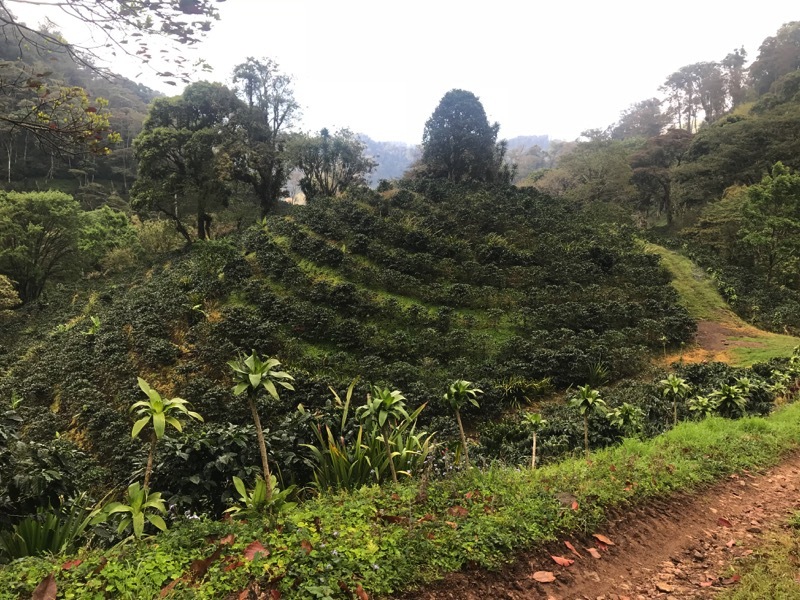 So, I was particularly interested on this Coffee Origin Road Trip to Nicaragua to be visiting the terroir of La Bastilla, where we have had some amazing coffees from in the past and which we had just recently sampled and ordered a new concoction, descriptively called Blueberry Candy. Nothing could quite prepare me though for the majestic rainforest that surrounded us at La Bastilla, so beautiful in fact that tourists paid their hard earned cash to stay in the Eco-lodges that we would be staying in that night - not on holiday you understand...! Our generous host, Markus, Swiss born part owner of this huge 311 ha estate, was to be the metronome that kept our hectic schedule ticking over. 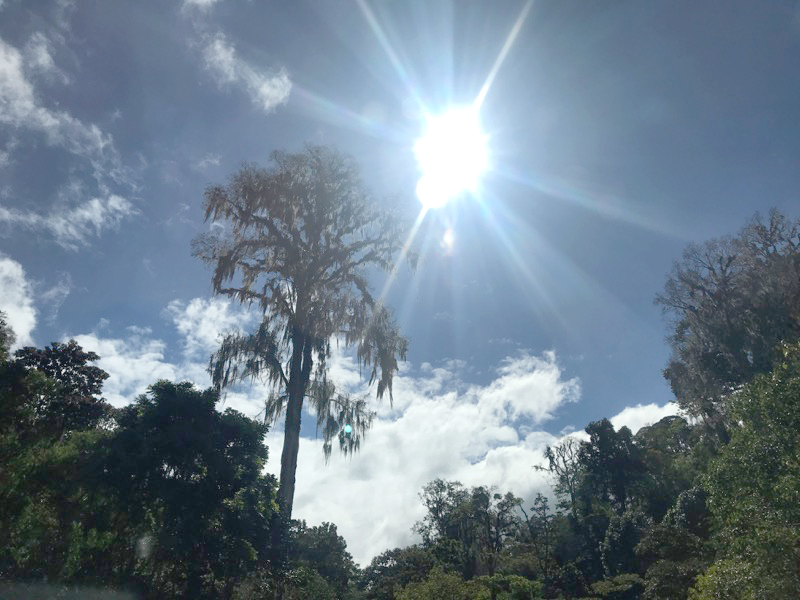 Our direction out of the city of Jinotega , towards the farm, meant that we were treated to a small but super smooth stretch of the Pan American Highway, at 30,000 miles, the longest 'motorable' stretch of road in the world. 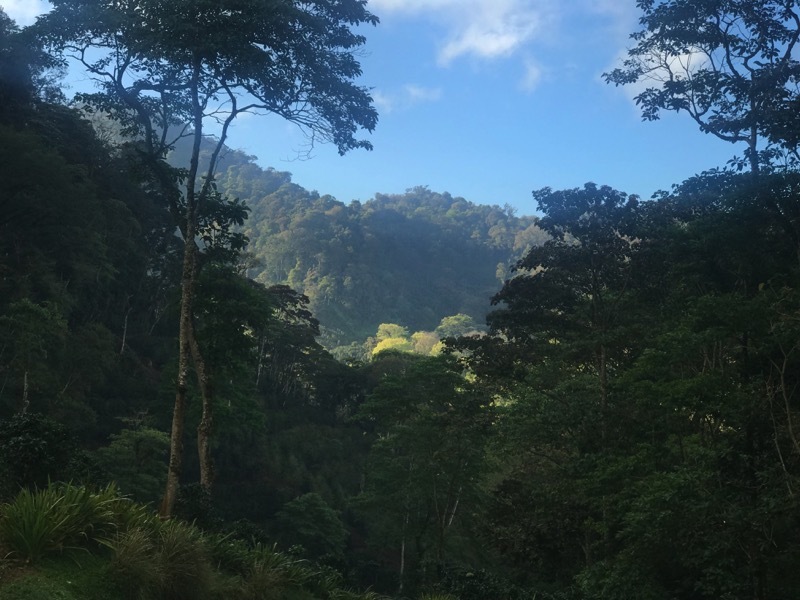 As we forged our way forwards and upwards, the bio-diversity increased with the bumpiness of the ride, as we climbed into some of the most magnificently picturesque rainforest I have ever seen. 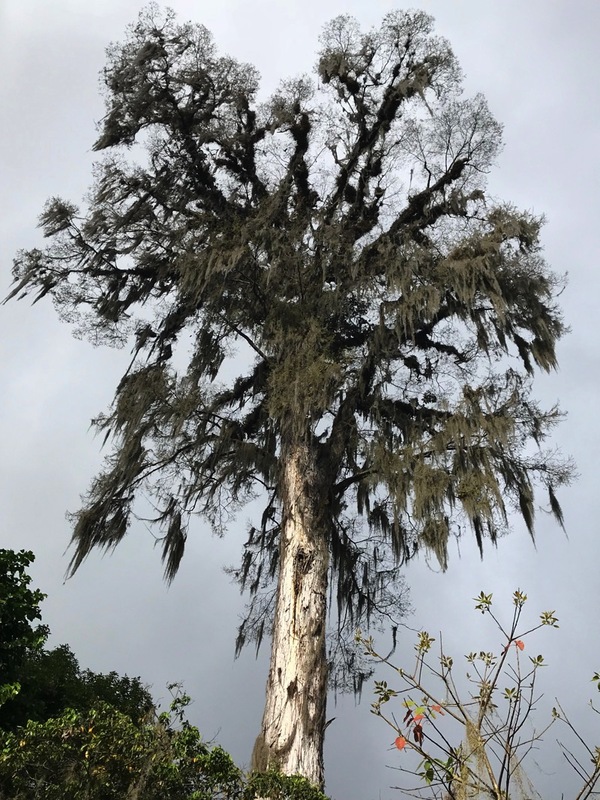 Huge mature canopy trees draped with hipster-length Old Man's Beard, the greyish lichen of the Usnea family, a clear indication of just how high the recent rainfall has been. 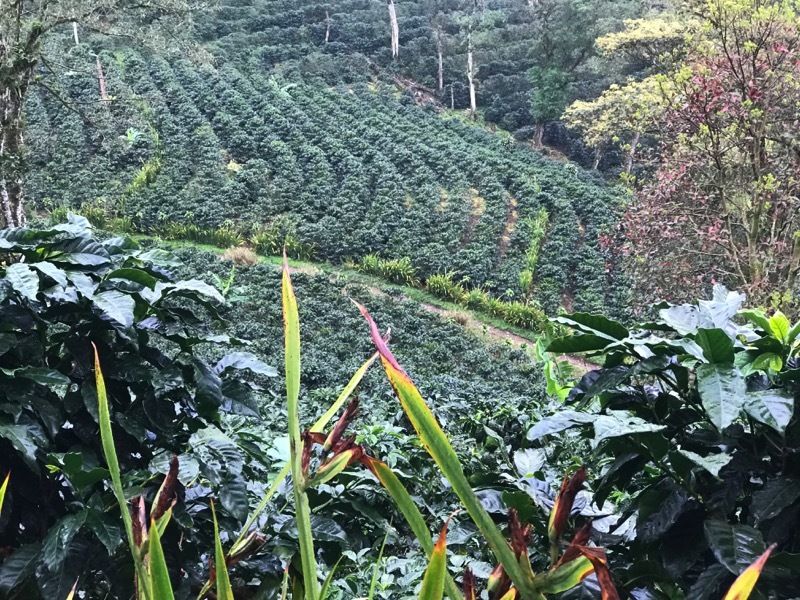 In this rich habitat there were several more levels of canopy before arriving at the under-canopy where the coffee trees flourished. Waiting for us at the cupping room was Juanita, head of QC and a qualified Q Grader, just one of many local youngsters to have graduated from the on-site Agricultural College. Places are open to all local families but only about 10% of children from age 15 onwards have that extra spark of ambition to become boarders and learn on the farm through experience. Subjects include modern farming techniques, to working in hospitality in the Eco-lodges. Juanita and Markus had devised an intriguing blind cupping for us... I gave them a pack of Award Winning Blue Sky Blend Tea to add to their taste library. He was using the opportunity of having a random group of international cuppers (us!) 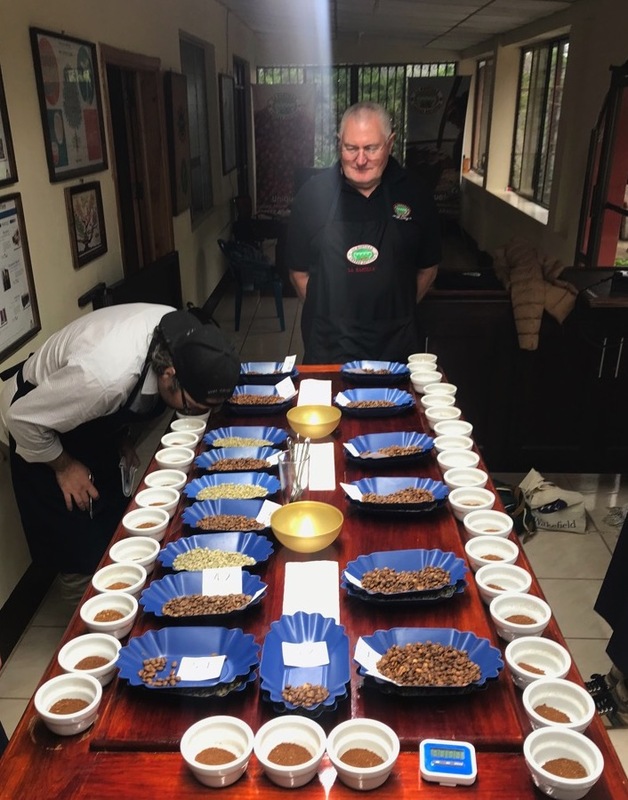 to test a groundbreaking new process, on a table that also boasted some extra special lots that were being put forward for the Nicaraguan Cup of Excellence What is the Cup of Excellence? . Keeping a very straight poker face throughout he finally showed his delight when, as so often happens, we all reached a consensus on the standout cup. Amongst the explosion of flavours we noted lavender, lime strawberry and caramel. What was this crazy fruit bomb?! It turns out Markus had been experimenting with the mysterious fermentation part of the process, by adding wine yeast to the overnight soaking to accelerate the anaerobic fermentation. This had obviously worked some kind of magic, which meant that the rest of the day could follow Markus's Masterplan! 1) It saves the tree wasting its energy and growth on fruit that won't be picked. 2) It reduces the risk of pests, like Broca, the borer beetle, infecting the plants by feeding on rotting fruit. The pickers, who had been called to work by the foreman's horn at 4.30 in the morning, had now cleaned all the bushes and sorted the cherry into piles of black & green and red & yellow, ordered carefully into tarpaulins on the ground. At that point a smart new Mercedes truck arrived and the well choreographed routine of measuring out and recording each pickers day's picking and loading them up onto the lorry unfolded in a de-mob happy atmosphere. We then followed the lorry with the last harvest on board over to the mill to watch the unloading and wet-pulping. This was no ordinary consignment of cherries. This was to be soaked overnight with the wine yeast added to macerate and accelerate the development of those much sought-after new-wave boozy notes. But before we could see and smell the results, Markus had two more treats up his sleeve. That evening we dined on the freshest of fare served up by the students in the kitchen at the Eco-lodge. The brightest of their generation, they all had an extra twinkle in their eye and despite having grown up in a rural village, they achieved high levels of service. The food was excellent and I couldn't help thinking what their families would think back home when presented with these new ways of preparing the traditional food. The other treat was a glorious celebration of two of Nicaragua's other premium exports - Rum & Cigars! But really it was a long rambling enjoyable evening discourse between like-minded coffee souls gathered together for one night only under the canopy of the rainforest night. Markus had been managing the farm for the last fifteen years, so must cherish evenings like this when the outside world comes gate-crashing into his tropical paradise. I somehow managed to burn the candle at both ends and was up at five ready to rumble in the jungle for an early morning hike, the overnight howler monkeys gave way to a wild warbling dawn chorus. We were heading for a rocky outcrop known as the Devil's Horn, when Markus decided we should take a short-cut. (I think he was eager to get back and see what was happening in the fermentation tank!) The path became a ladder cut into the hillside at a lung-bursting angle of 60°, well, lung-bursting for me, unaccustomed to these altitudes. It gave a real insight into the terrain that the coffee pickers contend with to bring our harvest home. One reason for the detour was to discover an old Guerrilla lookout post, now crumbling back into the forest loam but a still salient reminder of how treacherous and impenetrable this part of the world was in the not-too-distant past. We were now looking down on the Devil's Doo-dah, which had seemed so high up when we first set off. 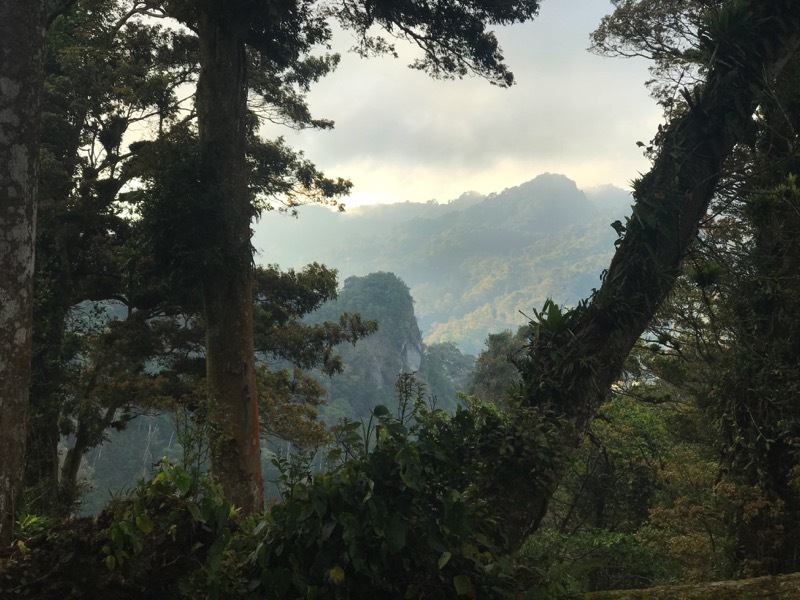 Breathtaking views of sunrise over the rainforest accompanied our downward path, as we headed back to the lodge for a well deserved breakfast. Then it was the moment we had all been waiting for - back to the mill to check out the activity of the yeast in the fermentation tank. 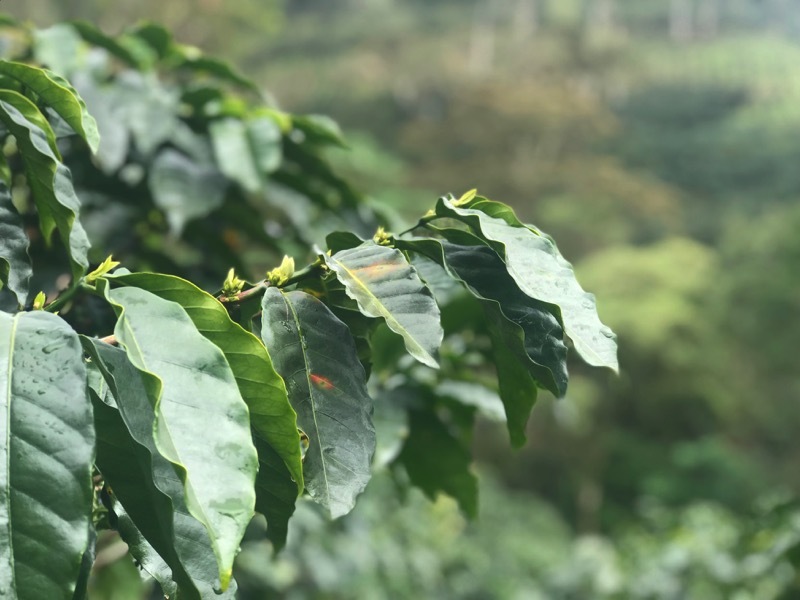 Of all the elements that influence the flavour of our coffee - variety, terroir, process, roasting, brewing, perhaps Process is the most dominant force. So, when we intervene in the process, we know we are tinkering with the building blocks of coffee! In Advertising we are always looking for the next Big Thing. The Madmens' favourite word is "NEW". 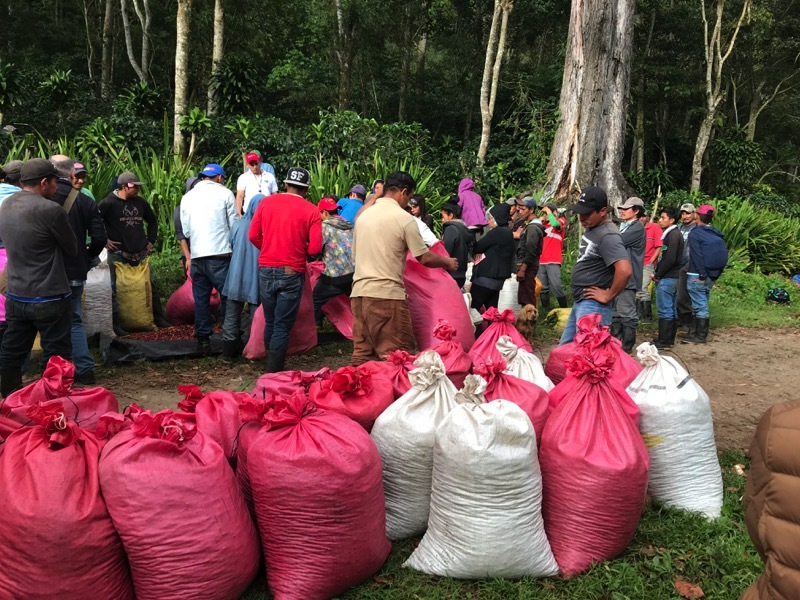 One of our favourite words in Speciality Coffee is "Sustainability" which, in an economic sense means sticking with your family of suppliers through thick and thin, rather than chopping and changing, we should all be working towards some kind of financial security, that delivers to all involved in the supply chain. Nowadays, of course we are referring to it in some quarters as the 'Value Chain' and by making all these marginal gains, like helping a small batch of cherry to ferment more controllably, we are adding value, but of course this only applies if the resulting brew is exciting enough to command a higher price.